Home > Readymade Picture Frames > 8x10" / 20x25cm Piazza Dark Oak hand Crafted Wood Picture Frame. Wood Stain Finish. Flat Profile: 36mm Wide x 20mm deep. Part of Kenro?s outstanding D?cor picture frame range, Piazza Series picture frames are available in four popular sizes and two stylish colours. Surrounding the picture window is a wood-effect frame 26mm wide in either light ash or dark oak colour, with a metal-effect 10mm rim to finish the outer edges. 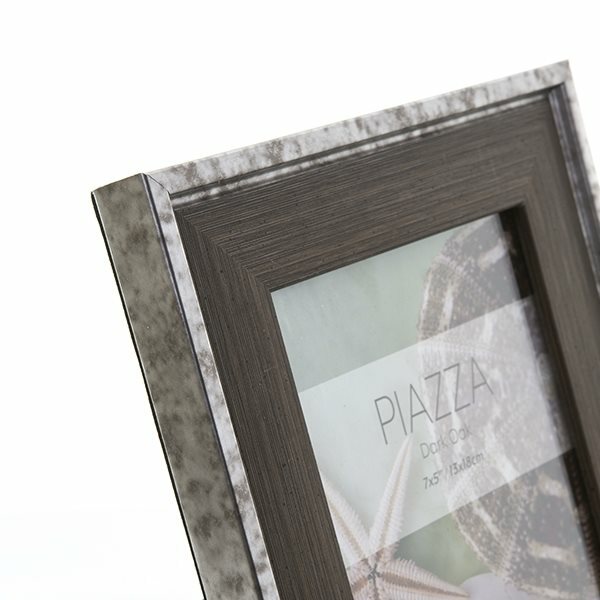 These picture frames have a modern, contemporary look and are supplied shrink wrapped with protective card corners. 1. EDGY FINISH ? With a 26mm wood-effect profile in light ash grey or dark oak brown, bordered by a 10mm metal-effect rim, this picture frame has a modern, contemporary finish. 2. POPULAR SIZES ? This picture frame holds one photograph and is available in four popular sizes. 3. FREESTANDING FRAME ? This picture frame has a strong hardboard easel back for freestanding landscape or portrait display. 4. PROTECTIVE PACKAGING ? Each picture frame is supplied individually shrink wrapped with protective card corners. 5. PIAZZA SERIES ? 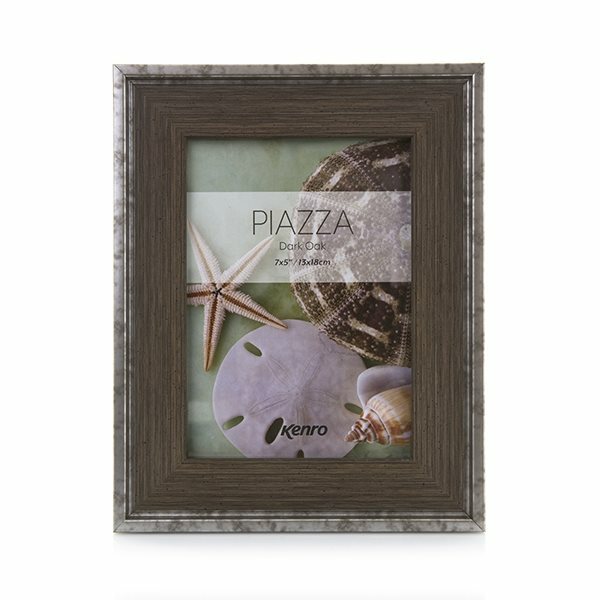 The Kenro Piazza Series of home d?cor picture frames is available in 4 popular sizes and two stylish colours.